There are multiple myths and stigmas against the Millennial generation. 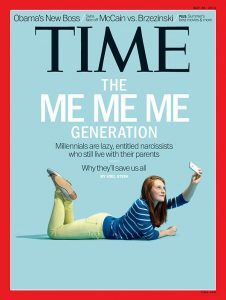 I’m sure just reading the word Millennial sparked one or two in your mind. Perhaps you think that they are all on their parents’ couches or in their basement; that they are lazy and privileged. The truth of the matter is, many young professionals come from the Millennial generation. 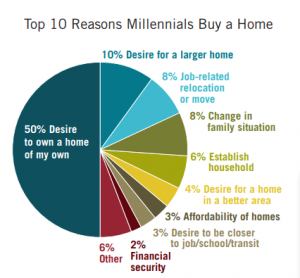 Common beliefs are that Millennials don’t care to buy a home. However, there are a large percentage of this group who are officially “adulting,” as they call it, and desire to establish their own household. Today’s Buyer Rep, brought to you by the National Association of Realtors, states that “An improving economy has helped put Millennials (who now outnumber Baby Boomers) in a better position to become homeowners.” Say what you will about their lifestyle, but studies show that they are motivated and able to buy— and they’ve already begun doing so. In fact, this past year alone showed a 1.3% increase in home ownership among Millennials. Wall Street Journal called this the largest increase of any age group over the past year. They are on the rise. In fact the National Association of Realtors found that half of Millennials buying are tired of renting because they want to own a home of their own or establish a household. The need to “have your own home” no longer becomes a motivator as older generations buy, because other factors come in to play more often. Millennials are choosing “Surban” areas, which feature suburban and urban communities; typically offering homes in better condition for better prices. Millennials are moving to cities that offer “tech hubs” (and Silicon Valley isn’t the only option anymore). Millennials are moving to the MidWest for the lower-than-average housing costs, the numerous colleges and universities, and healthy job opportunities (with unemployment rates well below the national average). Millennials are choosing 18-hour cities like Kansas City, Charleston, Boston, and more. These cities attract both residents and businesses with communities that allow people top grow with their careers. Millennials are choosing their homes and communities based on how green they are. Millennials are demanding specific and energy-efficient amenities for their home to be environmentally friendly— as well as saving on some costs in the long run. 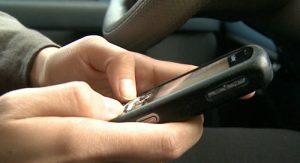 Today’s Buyer Rep also brings up the growing importance of technology in the home buying process. It’s true that we now have a need to create genuine messages in smaller snippets. Agents need to say goodbye to lengthy emails and long sentences/paragraphs. Nearly everyone, not just Millennials, relies on their mobile devices to view information. Depending on their font settings, “a paragraph containing just two sentences can easily fill someone’s screen.” You want whatever is in those first two sentences to count. Millennials are also creating a need for more video marketing and virtual tours. They are the first group to eagerly embrace virtual reality tours in the home buying process. Younger buyers will certainly give a listing a second look if it includes VR. It’s important to know that Millennial buyers are out there, and they are on the rise. They have also been cautious about this process because they have particular wants and needs. This may cause you to see them as entitled. Regardless of common misconceptions, they are motivated to find their perfect home.